Blowout Sale! Free Shipping Included! 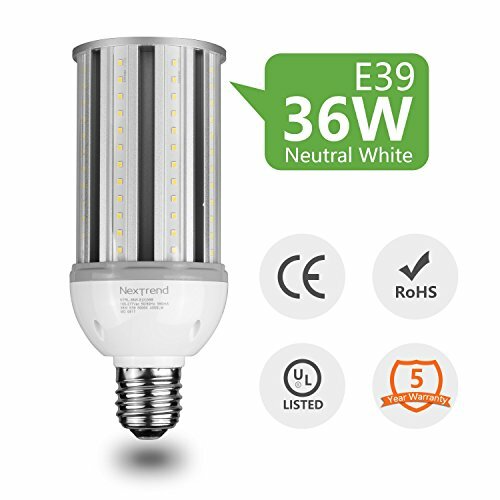 Save 59% on the 36W LED Corn Light, NexTrend 4350lm 180W Equivalent 5300K Daylight White LED Street and Area Light, E39 Medium Screw Base for Indoor/Outdoor Warehouse Garage Parking Lot High Bay Canopy, 360° Degree by NexTrend at Wakaf Center. MPN: E39 Base. Hurry! Limited time offer. Offer valid only while supplies last. The biggest weakness of LED bulb are large amount of heat, which will shorten the lifespan of the light or damage the light, and LED bulb is not 360 degrees shining, which means you can't get a consistent uniform light for all area. This LED corn light bulb has better quality LED driver circuit (less heat, more stable, long lifespan), and aviation aluminum lamp structure ( fast cooling, good quality). The aluminum structure of this bulb can solve the heat dissipation problem very well, this structure also allows the LED beads to be arrayed on the lamp body uniformly, which will ensure the 360 degrees shining of light, no dark area in any side. ✔ SUPER BRIGHT: 4350Lm-5300K neutral light E39 socket, 36W LED equal to 180W incandescent bulb. ✔ EXCELLENT HEAT DISSIPATION AND DURABLE : Aviation Aluminum base and Aluminum Heat Sink and Framework helps heat dissipation, extending its lifespan up to 50000 hours. Made of aluminum aviation are more durable and safe which can help cool the bulbs quickly,durable and safe . ✔ ENERGY SAVING AND LONG LIFESPAN: 5 traditional bulb, 360 degree shining without dead corner, consistent and stable luminescence. Energy savings of up to 85% over product's lifespan. Power consumption is 2/3 of energy-saving bulb under the same brightness. ✔ WIDE APPLICATION: Perfect for garage, workshop, warehouse, shop, garden, street, office, school, hospital, shopping center, supermarket, high bay lighting, station ect. ✔ TURN ON INSTANTLY AND HASSLE-FREE WARRANTY: Connect directly, when the switch is flipped, no more waiting for bults to "warm up" or turn all the way on. NexTrend five-year unlimited warranty.